Updated April 17, 2013: In light of recent events, I’ve decided to remove the ricin recipe plaintext from this post. The FBI, however, continues to display the encrypted ricin recipe on their website. Cryptographer Klaus Schmeh recently posted about a cryptogram that appears in an FBI article about how their Cryptanalysis and Racketeering Records Unit (CRRU) breaks codes and ciphers to solve crimes. 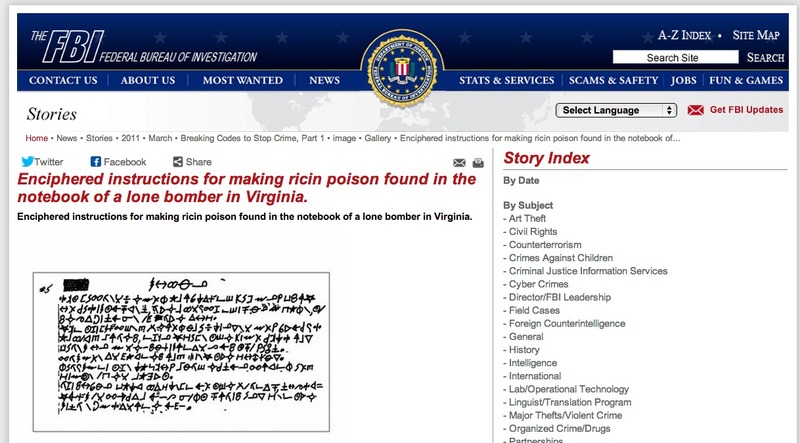 The FBI article says the cryptogram contains “enciphered instructions for making ricin poison found in the notebook of a lone bomber in Virginia.” I couldn’t find any decryptions of the cipher text, so I transcribed it, and fed it into zkdecrypto lite, which very quickly found a rough approximation of the plaintext. A little bit of extra work yielded the full solution, which really does contain a recipe for ricin poison, encrypted using simple homophonic substitution. The FBI already posted the cryptogram in full view of the public. The cryptogram is very easy to solve. Ricin recipes are already very easy to come by via Google searches. Only one death has been attributed to ricin poisoning. Every other ricin-related incident seems to involve dumbasses stockpiling the stuff for its claimed deadly potential. And here is the full analysis of the solution, including the solution key, symbol cycles, and symbol frequencies. The cryptogram bears some interesting similarities to the Zodiac’s ciphers: It is 354 characters long (to Zodiac’s 340), has 65 distinct symbols (to Zodiac’s 64 in the 408-character cipher), uses homophonic substitution (like Zodiac’s 408), and uses some of the same symbols. The ricin bomber, however, did not do a good job of concealing the letter frequencies of the plaintext. In fact, if you look at the symbol frequencies, the most common symbols correspond directly to the most common letters in English: E, T, A, O, N, etc. This is because the lone bomber did not correctly flatten the frequencies with the proper number of symbol assignments per plain text letter. 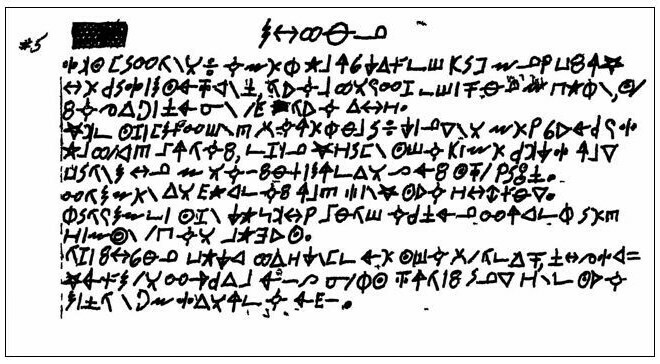 The FBI says this cryptogram is just one small part of 24 pages of enciphered messages. It would be interesting to see what else was in the notebook, and to know more about the bomber. I can’t find any news sources that mention the Virginia lone bomber. Does anyone have any ideas? a Web site that allows visitors to make changes, contributions, or corrections. ← Are the ciphers prime-phobic?